Like most smartwatches announced at Baselworld, we don't have many details. They're called the Q Venture and Q Explorist, and are described as, "the brand's slimmest, most feature-packed touchscreen smartwatches to date." Both devices are presumably running Android Wear 2.0, and appear to have a digital crown for easier navigation. However, there does appear to be one significant downside to these watches. Notice how the promotional image shows a black watchface on both devices - this may be intended to hide a 'flat tire' display. All of Fossil's previous watches, including the late-2016 Q Marshal and Q Wander, have a flat tire screen instead of a fully round display. Fossil expects the Q Venture and Q Explorist to go on sale in Fall of this year, and they will cost between $255 and $275, depending on the model and color. BASEL, Switzerland, March 23, 2017 /PRNewswire/ -- Fossil Group (NASDAQ: FOSL) will launch more than 300 connected watch styles across 14 brands in 2017, the company announced today. From slimmer and smaller hybrid smartwatches to full-round touchscreen smartwatches with custom AMOLED displays and branded micro-apps, this unprecedented portfolio of fashion-first tech accessories makes one thing clear: By reimagining the watch experience, Fossil Group has, quite simply, reinvented the watch. Fossil Group is showcasing its latest designs at its European Headquarters in Basel, Switzerland during Baselworld, the world's leading watch and jewelry fair. "Many of our brands that first entered the wearables space less than a year ago are now branching out with new styles, colors and types of wearables, all showcasing the perfect fusion of fashion and technology," said Greg McKelvey, chief strategy and digital officer, Fossil Group. "Our unrivaled speed to market is only possible through our relentless investments in innovation, our unmatched scale and operational capabilities, and our strong partnerships with the world's most admired fashion brands." "This explosion of new styles is further proof that the entire purpose of the watch is changing," McKelvey added. "Our customers are no longer wearing a watch simply to tell time, they are wearing it to stay connected to the people and activities they care about most while remaining fashionably on-point. We're thrilled to offer them so many ways to maintain those connections, and to do it with beauty and uncompromised style." Since launching its first smartwatch in Fall 2015, Fossil Group has brought to market more than 150 touchscreen smartwatches, hybrid smartwatches and activity trackers throughout 40 countries and in 20 languages for brands including Chaps, Diesel, Emporio Armani, Armani Exchange, Fossil, kate spade new york, Michael Kors, Misfit and Skagen. New Fossil Group brands entering the wearables space in 2017 include DKNY, Marc Jacobs, MICHELE, Relic and Tory Burch. Hybrid Smartwatches: Fossil Group's line-up of 2017 hybrid smartwatches – connected watches with discreet notifications and activity tracking that look like traditional watches – are now slimmer, sleeker and smarter. With new design variations and more functional side-button pushers that can be assigned to specific tasks (such as, "ring your phone," take a selfie, track a goal or control music), the hybrid smartwatch is increasingly versatile and customizable. "As an innovator in the fashion watch space, we knew that Fossil Group had the ability to launch a new category of watches that would be extremely relevant to a new generation of watch wearers," says Steve Evans, executive vice president, Fossil Brand. "We pride ourselves as being 'watch geeks' and became obsessed with transforming the watch category as it stands. We knew there was a need for an evolution, and we felt that no other company in the industry could surpass our commitment and ability to revolutionize the watch space. We are confident that the launch of hybrid smartwatches across multiple brands this year will be a transformative moment in the watch industry, and we look forward to exciting and educating customers globally that Fossil Group has a (smart) watch for every wrist." 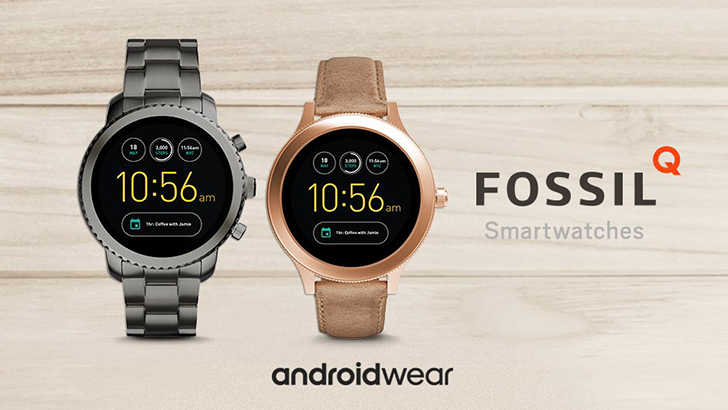 Touchscreen Smartwatches: Fossil Group's new 2017 touchscreen smartwatches, compatible with both iOS® and Android™ phones, are powered by Android Wear™ 2.0, Google's smart watch platform and a Qualcomm® Snapdragon Wear™ 2100 processor. They feature one-of-a-kind, full-AMOLED, high-resolution screens that preserve the integrity of sophisticated watch design while enabling crystal clear illumination. Customers will personalize the watch faces by choosing from millions of branded dial designs developed and programmed by Fossil Group. In addition, Android Wear™ 2.0 allows users to customize key information to appear on their watch face, create shortcuts to play music, call a car or monitor activity goals. Additionally, user's third-party apps can be downloaded through the on-watch Google Play™ Store. "Our new touchscreen smartwatches are better in every way – from the screen resolution and fast, wireless charging to the case size and branded micro-apps," said Eric Anderson, executive vice president of Portfolio Brands, Fossil Group. "And, while 2016 was a banner year for our smartwatch innovation and introductions, the tangible results of Fossil Group's innovation are creating tremendous opportunity for our wearables in 2017." Touchscreen Smartwatch Micro-apps: Branded smartwatch micro-apps – custom apps designed with each brand's smartwatch customer in mind and without the need to be tethered to a smartphone – will be rolled out with each brand's new touchscreen smartwatch. Enabled by Android Wear™ 2.0 and built by Fossil Group's internal software development team, each micro-app for Fossil, Michael Kors, Emporio Armani and Misfit Vapor touchscreen smartwatches will offer unique functionalities in line with the brands' DNA and target consumer in mind. For example, the Michael Kors Access "My Social" micro-app will allow the customer to use a photo from his/her Instagram as the touchscreen smartwatch dial background. "Fossil Group is uniquely positioned to succeed. We bring the rich history in fashion, portfolio of brands, design prowess and sophisticated software development that's required to drive strong sales in this competitive market," said McKelvey. Fossil Group, Inc. is a global design, marketing, distribution and innovation company specializing in lifestyle accessories. Under a diverse portfolio of owned and licensed brands, our offerings include fashion watches, jewelry, handbags, small leather goods and wearables. With our newest owned brand, Misfit, we're bringing style and technology to the high-growth connected space. We're committed to delivering the best in design and innovation across our owned brands, Fossil, Michele, Misfit, Relic, Skagen and Zodiac, and licensed brands, adidas, Armani Exchange, Burberry, Chaps, Diesel, DKNY, Emporio Armani, Karl Lagerfeld, kate spade new york, Marc Jacobs, Michael Kors and Tory Burch. We bring each brand story to life through an extensive wholesale distribution network across approximately 150 countries and nearly 600 retail locations. Certain press release and SEC filing information concerning the Company is also available at www.fossilgroup.com. *The Google Assistant is not available in all languages. Android, Android Wear, Google Play, Google Fit and other marks are trademarks of Google Inc.
Android Wear™ and Android are trademarks of Google Inc.